This document is not only one of the most important works on Muggletonianism of all time but it also became a part of the history of Muggletonianism. 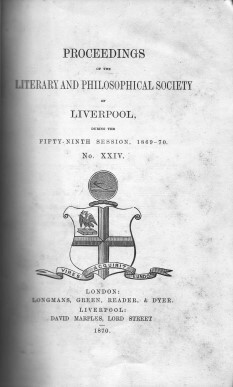 Gordon sent a copy of his 1869 lecture "The Origin of the Muggletonians" to a prominent Muggletonian who were so impressed by his tone that he was invited to an anniversary dinner (the great festival commemorating John Reeve receiving the great commission) and for a limited time he was given access to the fabled Muggletonian archives. The result of which was this 1870 lecture. It was as a result of this information concerning the archive that E P Thompson sought the missing documents and made contact with the "last Muggletonian" Philip Noakes, as a result of which this archive was preserved for posterity at the British Museum. This study contains a treasure trove of information and details that were obtained from what was still a vibrant and not insignificant movement. Without this document we would not know that the antique silver ladle used to serve the port at the annual meetings had been donated by the rather appropriately named Mr Spooner, fantastic stuff.